Two men wearing ski masks kidnapped a bank employee in Huntington Park, held her overnight, attached a supposed bomb to her and then had her rob an East Los Angeles bank, according to the LA County Sheriff's Department. NBC's Brian Williams reports. Updated at 12:04 a.m. ET: Two men wearing ski masks kidnapped a bank employee in Huntington Park, held her overnight, attached a supposed bomb to her and then had her rob an East Los Angeles bank, according to the LA County Sheriff's Department. The female victim, who was being questioned by detectives, is an employee of the bank, authorities confirmed late Wednesday morning. She was abducted from her home in Huntington Park on Tuesday, LASD Capt. Mike Parker said. "She was held against her will until the morning," he said. "At about 8:30 this morning, she was at the bank. It is unclear at this moment whether she was brought to the bank or drove herself here." "She went into the bank, and she told another employee or employees that she had this device attached to her, and that she was demanded by the robbers to (get) the money from the bank and throw it outside," Parker said. The SWAT force, bomb squad, sheriff's deputies, and the fire department responded to the Bank of America branch, located at 941 Atlantic Blvd. (map). Aerial video showed a deputy removing a small, dark-colored object from the bank and placing it along a street curb. Shortly after, a bomb-squad robot was sent into the area. At 9:30 a.m., an armored member of the bomb squad surrounded the device with what appeared to be sand bags. 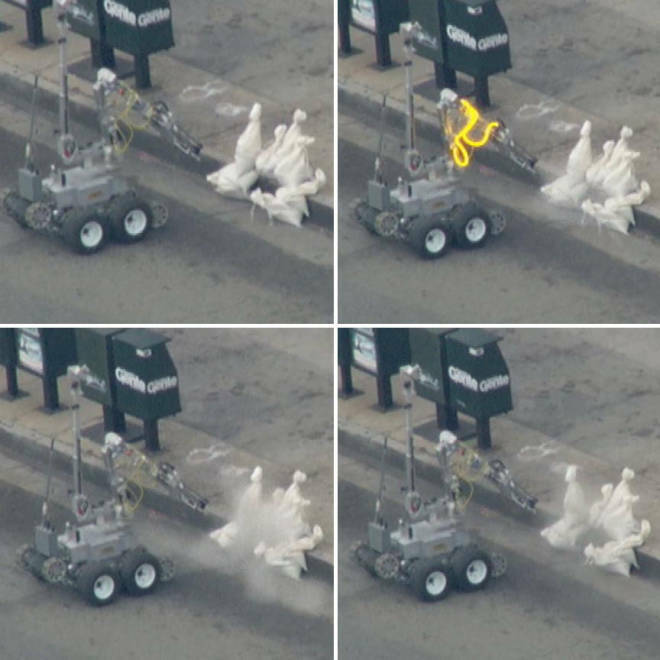 At 9:45 a.m., the robot fired a projectile into the device (see images). An apparent shell casing was discharged from the robot. Investigators do not believe the device posed a threat to the employee, Lt. Neal Mongan with Huntington Park Police said during a news conference Wednesday night. A robot fires a projectile into a device outside a bank in East Los Angeles. Authorities suspected the device might be an explosive. The robot was then moved to a nearby parking lot to inspect the area. Authorities are still searching for the two alleged robbers. Earlier reports noted the men fled in a Kia, possibly white, but late Wednesday authorities said they could not confirm a suspect-vehicle description. At least one of the suspects had a gun. A statement released by Bank of America read: "The safety and security of our employees and customers are our highest priority, and we are working closely with law enforcement on this matter." "Because this is an active investigation, we defer to the LA County Sheriff's Department what details to be made public at this time," the statement read. The bank would not confirm the woman's employment status. It is now referring all questions to law enforcement.